Last November my family traveled to Walt Disney World as a family of 3 (well, 4 if you count that I was pregnant in 2nd trimester.) The vacation was everything we hoped for and we are returning this October for another trip. We really tried to maximize time in the parks as well as enjoying our great stay at Disney's Port Orleans Riverside Resort. Time to Go: We decided to try for fall given that it is Value season and hotel rates are at the lowest of the year. We did a 5 day/4 night trip during the second week of November. Weather was in the 70-80s so we could still enjoy the pool. If I were to do it over, I would have gone before daylight savings time ended. Once it got dark, it was hard to be motivated to get out again. The only day the parks were even remotely crowded was Veterans Day. We typically had no more than a 15 minute wait for attractions. Using the FASTPASS system was a lifesaver. It prevented us from spending oodles of time in line. I did bring line-waiting supplies like bubbles and loaded some games on our iPhones. Travel: We opted to take the overnight Amtrak Silver Star Line train from Raleigh to Orlando for around $200.00 round trip for all 3 of us. I think our 3 year old son loved riding on the train as much as he did WDW. We took a town car for less than $100.00 round trip. If we had flown, we would have been eligible for the Disney Magical Express since we were staying on Disney property. Food: We took advantage of a promotion offering the Disney Dining Plan for free. We estimated this saved us around $500-$700. I printed off the listing of restaurants, character meals, and options and then researched each restaurant we were considering. We had two character meals which normally would have cost us $20-40 per person if we had not had the plan. I also researched where we could get the most "bang for our buck" and quickly realized that a $4.00 milkshake and a $.99 soda counted the same in snack credits. Having a fridge in our room was a major help storing extra water and juice boxes to offset food costs. Wingin' It: Once we were back in the room each night, we planned the next day and repacked the backpack. I researched what attractions were most appropriate for our son’s age and considered the scare factor. There is a great table in the guidebook The Unofficial Guide to Walt Disney World. I was the map queen and planned how to see the most with the least amount of walking. We made a list of which attractions were the most important to us and which were ok to skip for each park, grouped by area. I included an estimate of when we wanted to be back at the resort for naps so we could be on time for each night’s dinner reservations. Stroller/Bag: We took a cheap umbrella stroller that I clearly marked as ours. I didn’t care if I left it at the hotel not to carry it back home at the end of the trip. You can rent strollers for $15.00/single per day at Disney but you can't take them on Disney transportation, even the train that encircles the Magic Kingdom. We also carried a well-organized backpack that Bill and I traded carrying. Using your cell/texting to avoid waiting in line: Many times we split up to get a FASTPASS for a ride which we expected to have a line. We researched which rides had FASTPASS and tried using the system at Disney’s Animal Kingdom Park on our first full day there. I highly recommend learning this system to see the most and wait the least amount of time. Many times Bill and I took a picture of a line, emailed it, and made a judgment call about getting in line. We also often saved a place in line while someone hit the bathrooms and then texted where we were to catch up. While we didn't use the pre-set touring plans in the Unofficial Guide, I did look at them and if it was peak season I would have definitely used them. Souvenirs: Bill took Ben to the Disney Store at home and let him pick out a plush Mickey to take with him on the train and sleep with at night. I went to Target the week before to get blister treatments and other first aid stuff, a glow stick/flashlight necklace for Ben to keep him occupied while waiting at night and then hit the dollar bin where they had tons of Mickey themed things. We are so very excited to be going back during the Food and Wine Festival. 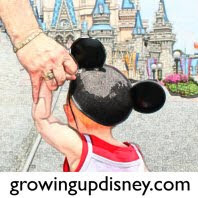 I hope these tips will prove helpful and maximize your Disney experience.